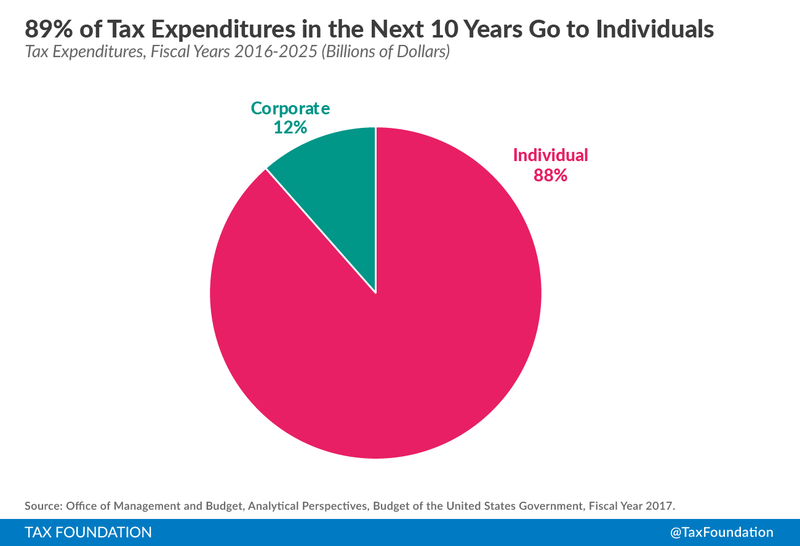 The total cost of tax expenditures from 2016-2025 is $17 trillion, with $2 trillion in corporate expenditures and $15.1 trillion in individual expenditures. The most obvious kind of tax expenditure is a provision that directly lowers the tax burden for a subset of taxpayers engaged in a specific activity. For example, consider a taxpayer claiming the American Opportunity Tax Credit who gets a lower tax bill because he has qualifying college expenses. One could achieve a functionally identical result by administering the credit through a spending program instead of the IRS. The tax credit “spends” by forgoing the revenue collection in the first place. Given that a tax expenditure is defined as a departure from the “normal” tax code, the nature of tax expenditures depends crucially on what the “normal” tax code is. The Treasury Department and the Joint Committee on Taxation (JCT) have adopted similar definitions, but while these definitions have been consistent, they are not economically coherent. There are, of course, alternative tax bases. Among these are sales taxes, value-added taxes (VATs), excise taxes, corporate income taxes, payroll taxes, and property taxes. All of these tax bases are used in various places around the world, and all have benefits and drawbacks. There is no objective reason to define any particular tax base as “normal” for the purposes of counting tax expenditures. The majority of the expenses incurred by tax expenditures comes from the individual side. For Fiscal Years 2016 to 2025, the Office of Management and Budget (OMB) projects $2.0 trillion in corporate tax expenditures and $15.1 trillion in individual tax expenditures for more than $17.0 trillion in total. The largest individual tax expenditures usually have one of two roles. The first role is to prioritize certain kinds of consumer spending (especially housing and healthcare) over others. This is a practice that should be reviewed with skepticism; the primary purpose of the IRS should be to raise revenue, not to encourage particular types of economic activity. 1. The Exclusion of Employer Contributions for Medical Insurance Premiums ($2.7 trillion). Employer contributions to insurance premiums reflect a tax preference for those taxpayers with employer-provided health insurance, because they receive a form of labor compensation that goes untaxed. This is easily the largest tax preference – for example, larger than all corporate tax expenditures combined. 2. Exclusion of Net Imputed Rental Income ($1.2 trillion). This line item comes from owner-occupied housing. In our tax code, if you rent real estate to someone, you pay taxes on that rental income. However, if you “rent” the real estate to yourself by living in your own home, there is no market income to tax. Your “income” comes from the personal benefit you get from your home. This benefit is called imputed rent. This exclusion is considered a tax expenditure due to the definition of income used in the tax code. 3. Lower Rate for Capital Gains ($1.1 trillion). This is listed as a tax expenditure because the normal tax code defined by JCT includes a full Haig-Simons individual income tax in addition to a corporate income tax. This tax expenditure, in some ways, returns to a pure Haig-Simons definition, because it acknowledges and compensates for the corporate income tax on the individual side. Shareholders can pay taxes either individually or through corporations, and the U.S. income tax code – in practice – splits the burden between the two. Other countries, like Australia, also split this burden, but they do it in a more explicit and intentional way through corporate integration. 4. Deductibility of Mortgage Interest on Owner-Occupied Housing ($948 billion). This is the largest individual tax deduction and the third-largest individual tax expenditure. There is some logic with this expenditure: if interest income on mortgages is taxable, then the lost income from paying that interest should be deductible – otherwise the borrower and the lender are taxed on the same income, creating a double tax. However, this would be better addressed with some type of comprehensive treatment of interest rather than a specific one for owner-occupied housing alone. 5. Defined Contribution Employer Plans ($921 billion). 401(k) plans and similar retirement vehicles allow taxpayers to deduct retirement savings and pay income taxes only when those savings are withdrawn. 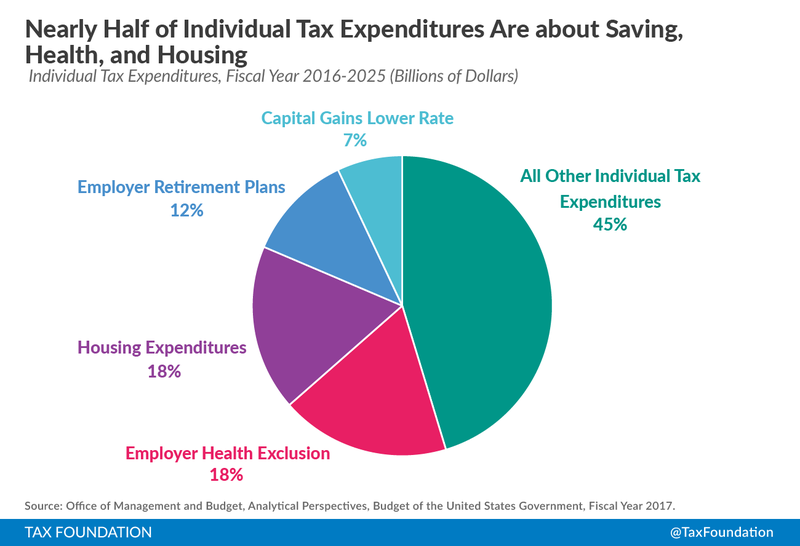 Defined benefit employer plans ($45 billion) and individual retirement accounts ($17 billion) are treated similarly, but counted as separate tax expenditures. These are lowered tax burdens only in the sense that they are considered a “deferral” of tax liability from what is seen as the normal tax code. Many tax systems – like those for pensions in most countries, not just ours – defer tax liability on pension contributions until the money is paid. Combining some of the large individual tax expenditures with similar purposes reveals that only a few big priorities motivate most tax expenditure spending. The three largest housing expenditures, for example –the imputed rent exclusion, the mortgage interest deduction, and the capital gains exclusion on housing sales – combine for $2.7 trillion. The employer-provided health insurance exclusion accounts for $2.7 trillion. Defined benefit and defined contribution plans together with individual retirement accounts add another $1.7 trillion. 1. Deferral of Income from Controlled Foreign Corporations ($853 billion). Deferral is the largest corporate tax expenditure, though still smaller than any of the big individual tax expenditures. This tax expenditure represents the fact that the additional domestic tax on foreign earnings (i.e., the repatriation tax), which is over and above what is paid abroad, can be deferred as long as the earnings remain invested abroad. 2. Accelerated Depreciation of Machinery and Equipment ($228 billion). This expenditure comes from the corporate tax code’s treatment of investment. When a physical asset – like an industrial lathe – is purchased, the corporate income tax code recognizes it as a legitimate business expense. However, its purchase price is written off over a depreciation schedule of years or decades and not all counted immediately. There are infinitely many schedules possible, specific to each individual kind of asset a business could possibly buy. There is a better way to go forward. While depreciation is a useful accounting concept to calculate book values of corporations, the economic costs of an asset should be reflected by expensing; that is, the cost of the asset should be deductible in the year that the money is actually spent, properly reflecting the time value of money. This is the sort of deduction that business transfer taxes or VATs use, and it is in many respects much more normal than anything that the U.S. has used in the past few decades. 3. Exclusion of Interest on State and Local Bonds for Public Purposes ($187 billion). Interest on certain municipal bonds is excluded from federal taxation. 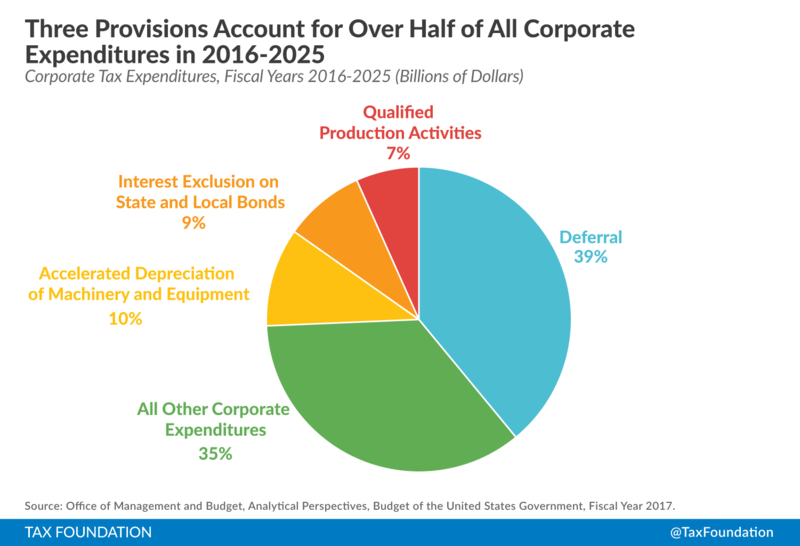 The loss of tax revenue from corporations that hold these bonds is expected to be $187 billion over 2016-2025. However, this measure is typically defined as a measure of aid to state and local governments, not as aid to the lenders. In practice, bondholders have to pay a premium for these tax-exempt bonds – that is, they are willing to accept lower interest rates. The money lost by the federal government, then, is given to states in the form of lower borrowing costs. 4. Deduction for U.S. Production Activities ($146 billion). Also known as Section 199, this is a 9 percent deduction for businesses with qualified production activities in the United States. Mathematically, it is equivalent to reducing the corporate income tax rate from 35 percent to 31.85 percent on income from qualified domestic production activities. Although this is certainly an incentive for businesses to invest in the United States, and it is taken by most industries, it is not applied to every industry. If this deduction were simply turned into a neutral rate reduction for all business, it would be better policy, and it would no longer be considered a tax expenditure. These expenditures make up a majority of corporate tax expenditures from 2016 to 2025. It is often said that the U.S. is also the only country in the OECD without a VAT. But taken as a whole, businesses in the U.S. do pay tax on something approximating the VAT base; business inputs are exempted, earnings to capital are taxed through the corporate income tax, and earnings to labor are taxed through the employer-side payroll tax. * The author would like to thank Anton Aurenius for his research assistance. Stanley Surrey, Federal Income Tax Reform, Harvard Law Review, Vol. 84, No. 2, pg. 352, Dec. 1970, http://www.jstor.org/stable/1339715?seq=1#page_scan_tab_contents. Office of Management and Budget, Analytical Perspectives: Budget of the U.S. Government, Fiscal Year 2017, at Tables 14-1 to 14-4, Feb. 2016, http://www.whitehouse.gov/omb/budget/Analytical_Perspectives. Kyle Pomerleau, Obamacare’s “Cadillac Tax” Working as Planned, Tax Foundation Tax Policy Blog, May 29, 2013, https://taxfoundation.org/blog/obamacares-cadillac-tax-working-planned. 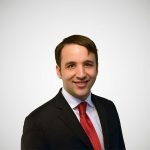 For more on international tax systems, see Kyle Pomerleau, 2015 International Tax Competitiveness Index, Tax Foundation, Sep. 28, 2015, https://taxfoundation.org/article/2015-international-tax-competitiveness-index.